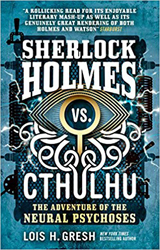 Sherlock Holmes Vs Cthulhu: The Adventures of the Neural Psychoses (2018. 398 pages) is the second part of Lois H. Gresh’s Holmes trilogy of books, the first being The Adventure of the Deadly Dimension. Flowing on directly from the events in the first novel, Holmes and Watson are in London having survived their last encounter with the Order of Dagon. Many issues remain unresolved. Within a heavily guarded building, the Feersum Endjinn remains, no longer spewing forth a cascade of gold. The monsters which had appeared in the same area have slithered off. Being a rational man, Moriarty has no interest in monsters, but has been slowly taking over all the land around the device hoping to steal it and its gold making abilities. Constructing dens where men can indulge in their addiction to Dr Reginald Sinclair’s Eshockers, electrical devices which promised a strange form of pleasure. Watson and Holmes meanwhile are in the Thames, hunting whatever is living in the river, although not with complete success, their venture upon the Thames seems to have a strange and chronic effect on Watson. Both Holmes and Cthulhu are heavily influenced by gothic Victoriana. Sir Arthur Conan Doyle’s Holmes, for all his pharmaceutical proclivities, represents the age of science. His intellect is vast and his adherence to logic saw him solve many crimes, both private and for Scotland Yard. If Watson was the everyman, Holmes was man stripped of the illogical and emotional. Cthulhu, although published much later, was very much in the gothic tradition. First appearing in the 1920’s, H. P. Lovecraft’s Cthulhu was the antithesis of everything Holmes stood for. There was no logic; there was no mercy, just the unrelenting indifference of the Universe and horrors which would melt the minds of lessor men. As such the two make a nice fit and I was interested to see how Gresh would handle these two competing world views. In truth, Gresh has decided to go for a middle way, producing a book which leans heavily toward creating an adventure story, similar in tone to a 1930 radio play. Elements of the Holmes novels remain, the fact that the story is told from Watson’s point of view. Various well known secondary characters’ appear, but the story is really about Holmes and Watson’s relationship. Likewise, Gresh has taken the physicality of the Cthulhu worshipers and made them one of the two central antagonists. They are shown, rather than hinted at, so much of the creeping disquiet felt in Lovecraft’s writing is missing. The chapters are seen from the various point of view characters, including Watson, Moriarty, Sinclair, Amelia, Nurse Switzer and Thwaite and this arrangement works well for the story. I cannot say that all of the elements were really required for the story which was being told, some of the threads felt a little superfluous. But, this is the second of three books, so overall; it is likely that all of the characters will be given their time in the limelight. If you don’t go into the book thinking that Gresh is trying to mimic the content or style of either Lovecraft or Doyle, but striving to use these influences to create her own universe, then you should be able to just sit back and enjoy the ride.